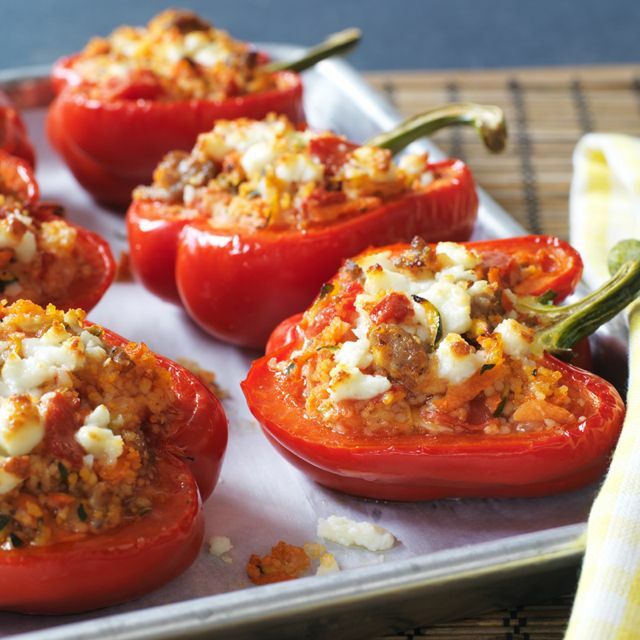 These sausage and couscous stuffed peppers are not only easy to make but very versatile. They can be served with a simple salad, taken to your next potluck or even served cold for lunch. The sausage in this recipe will add amazing flavour and the grated vegetables will add moisture. While rice is traditionally used in stuffed peppers, it takes too long to cook. Couscous is an ideal replacement and soaks up all the remaining tomato juice. 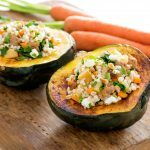 Making this dish will be a snap, especially if you have all your ingredients prepped before heading to the stove! Preheat oven to 400°F. 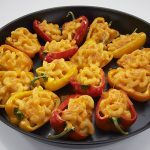 Place peppers cut side down on a parchment lined baking sheet and roast for 15 minutes – set a timer. While the peppers roast, heat oil in a large frying pan over medium heat. Add sausage and stir while cooking, breaking up the meat into small pieces until almost cooked, about 3 minutes. Add onion and garlic; cook and stir until onions are translucent, about 3 minutes. Add diced tomatoes, carrot, zucchini, and oregano. Cook, stirring occasionally until most of the liquid has absorbed, about 8 minutes. Remove from heat, stir in couscous, and set aside for 2 minutes. Stir in ½ cup of feta cheese. Season to taste with a pinch of salt. Flip peppers over and stuff well with sausage couscous mixture. Sprinkle peppers with remaining feta. Bake until peppers feel tender, about 17-20 minutes. A paring knife makes it easy to cut the seeds out the peppers, leaving the stems intact. The smaller you can break up the sausage meat, the more its flavour will spread throughout the stuffing. A wooden spoon is the best tool for the job, especially if you’re using a non-stick frying pan. Try experimenting with different types of sausage and vegetables. Finely chopped olives and mushrooms would be a tasty addition. Have leftovers? Eat them cold or heated. Finally tried this recipe tonight, I added fresh parsley from the garden and used mozzarella rather than feta (it's what I had in the fridge). SO good! !